Mmmm soup. When it’s cold, it warms you. When you’re sick, it soothes you. When you’re alone, you slurp it really loudly. Warming soups are more than just…warm. They have warming spices like ginger and cinnamon, which improve your circulation to spread warmth throughout the body. We’re big fans. We’ve been eating a lot of soup around the office, lately. Rachel is hooked on her unique recipe you’ll find below (bet you never thought you’d eat inca berries in a soup!) and Courtney tells us that despite the very simple ingredient list, the cauliflower soup she’s been making is quite delicious! 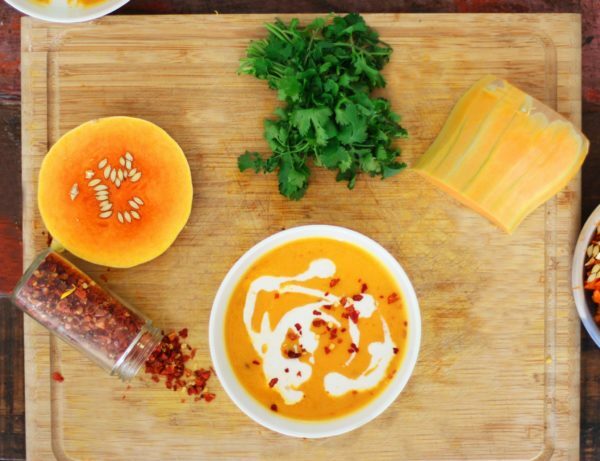 It’s sweater season, it’s cold season, it’s almost winter… It’s time for some soup. Here are our favorite warming soup recipes (which happen to be, I swear we didn’t mean to, mostly vegan). 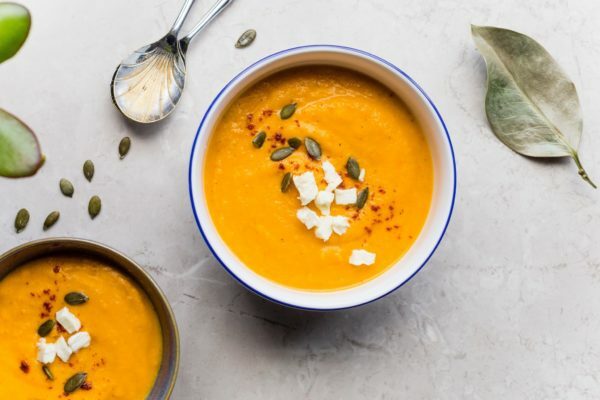 Cauliflower provides an amazingly smooth texture here, and is also high in vitamin C. Onions are a great food to eat when you’re sick, and also give this soup a great flavor. This might be your go-to next time you have the sniffles. Black pepper is the warming ingredient here, and is antibacterial as well as high in antioxidants! You may not think about it when you crank some onto your meals, but this yummy spice is also very healthy! Warm the olive oil in a heavy-bottomed pan. Sweat the onion in the olive oil over low heat, but don’t let it brown. Cook for about 15 minutes. Add the cauliflower and ½ cup water. Salt it to your liking. Raise the heat slightly and cover the pot tightly. Stew the cauliflower for 15-18 minutes, or until tender. Add 4 ½ cups of hot water and bring the pot to a low simmer. Cook for an additional 20 minutes, uncovered. Puree the soup in a blender in batches until very smooth and creamy. Alternatively, you can use a hand blender directly in the pot. Let the soup stand for 20 minutes. Thin the soup with ½ cup of hot water and reheat it. Serve it hot, drizzled with olive and oil and sprinkled with black pepper. Rachel loves the unique flavor of this soup she created. We’re pretty impressed by the assortment of ingredients. Incan berries are protein rich, and not only contain an array of vitamins, but also a small amount of melatonin, which helps regulate your sleep cycle. Nothing like a good night's sleep to promote overall wellness. Kimchee has beneficial bacteria that will help make your gut healthy, another keystone in building your overall health. Let us know if you try this one! Recipe by our own Rachel Pachivas. Cook all ingredients and pour into a bowl. Poach 2 eggs and place them on top. Enjoy! Abby told us she cooked this one up a few weeks ago, and we've been craving it ever since. Our team wholeheartedly agrees in our love for sweet potatoes. 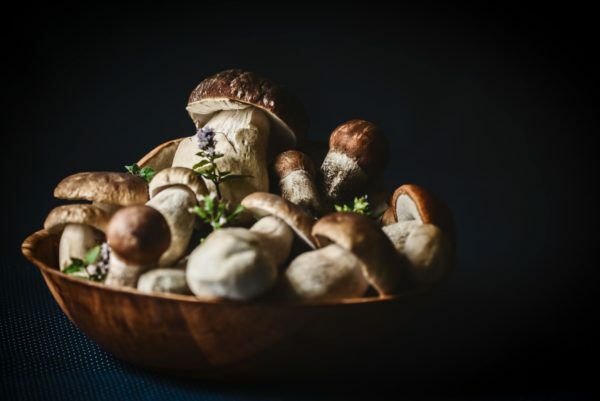 Did you know they are naturally resistant to GMOs? Ginger, cinnamon, and garlic in this recipe are all warming and improve your circulation. This is great for people who are chronically cold. Peanut butter in here might seem like a curveball, but it gives this soup some decadence. Kidney beans provide substance, helping you feel full and satisfied. Red bell peppers add extra vitamin C and deliciousness. Jalapeño and ginger will help clear our your sinuses. Heat coconut oil in a large saucepan over medium heat. Add onions and garlic and cook until softened, about 5 minutes. Add bell pepper and jalapeño and cook until softened, about 5 minutes. Stir in brown sugar, ginger, cumin, and cinnamon, and cook for 1-2 minutes, stirring continuously. Stir in peanut butter, distributing evenly throughout. Add sweet potatoes, kidney beans, and tomatoes. Stir to coat ingredients evenly. Add vegetable stock or water, bring to a boil, then reduce heat to low and simmer until sweet potatoes are soft, about 30 minutes. Stir in salt. Garnish with dry roasted peanuts and cilantro. Serve over quinoa or couscous. A month ago or so, Lisa sent us all this amazing recipe. I knew right away that I was going to try it. The original recipe calls for sweet potato, but I had recently been gifted a quite large squash. If you’ve ever cut open an oversized squash, you know that they get stringy and fibrous, so roasting them plain isn’t the best option. Turns out my stringy squash worked perfectly in this recipe. Turmeric, sage, curry powder, ginger, garlic, and red pepper flakes make this soup impeccably balanced and gently warming. I fed it to my house mates and both the spice-a-holic and the spice-a-phobic loved it. That is pretty special. Preheat oven to 400 degrees. Use this time to measure out spices. Deseed your squash and drizzle it with some olive oil. You can cut it into smaller pieces for faster roasting time. Put it on a try and stick it in the oven until it’s soft, about 30 minutes. Poke with a fork to test. Leave the skin on! You’re blending it up anyway. In a medium skillet, heat olive oil to medium and saute the onion until translucent, about 10 minutes. Add ginger, garlic, curry powder, turmeric, and sage, and saute for another 2 minutes. Add this mixture to the blender, along with the cooked squash, coconut milk, and stock. Blend until smooth. Add the soup back into the saute pan to heat to your desired temperature. Serve with cooked quinoa, fresh chopped cilantro, and sour cream on top. Do you have a favorite soup recipe? Let us know in the comments below! 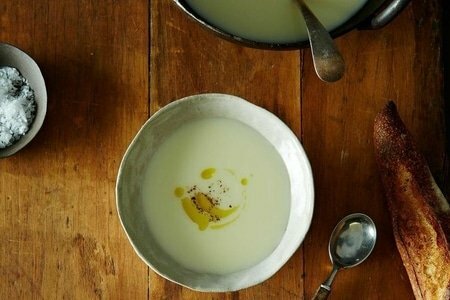 In the Cauliflower Soup are there 5 cups water vs. 5 half cups? Thank you for pointing that out! It its 5 cups, divded! These recipes look delicious. Are they available on Pinterest? I like to save all of my recipes there. These all look delicious and I will definitely try a couple of them. But, not to put too fine a point on it, eggs can be considered vegetarian but not vegan.